For hair cells on the external skin, see Hair follicle. For algal 'hair cells', see Trichocyte (disambiguation). Section through the spiral organ of Corti. Magnified. ("Outer hair cells" labeled near top; "inner hair cells" labeled near center). Cross-section of the cochlea. The inner hair cells are located at the termination of the "inner hair cell nerves" and the outer hair cells are located at the termination of the "outer hair cell nerves". 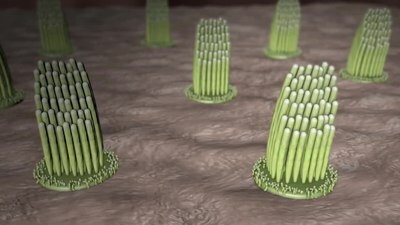 The deflection of the hair-cell stereocilia opens mechanically gated ion channels that allow any small, positively charged ions (primarily potassium and calcium) to enter the cell. Unlike many other electrically active cells, the hair cell itself does not fire an action potential. Instead, the influx of positive ions from the endolymph in the scala media depolarizes the cell, resulting in a receptor potential. This receptor potential opens voltage gated calcium channels; calcium ions then enter the cell and trigger the release of neurotransmitters at the basal end of the cell. The neurotransmitters diffuse across the narrow space between the hair cell and a nerve terminal, where they then bind to receptors and thus trigger action potentials in the nerve. In this way, the mechanical sound signal is converted into an electrical nerve signal. Repolarization of hair cells is done in a special manner. The perilymph in the scala tympani has a very low concentration of positive ions. The electrochemical gradient makes the positive ions flow through channels to the perilymph. Hair cells chronically leak Ca2+. This leakage causes a tonic release of neurotransmitter to the synapses. It is thought that this tonic release is what allows the hair cells to respond so quickly in response to mechanical stimuli. The quickness of the hair cell response may also be due to the fact that it can increase the amount of neurotransmitter release in response to a change as little as 100 μV in membrane potential. In mammalian outer hair cells, the receptor potential triggers active vibrations of the cell body. This mechanical response to electrical signals is termed somatic electromotility and drives oscillations in the cell’s length, which occur at the frequency of the incoming sound and provide mechanical feedback amplification. Outer hair cells are found only in mammals. While hearing sensitivity of mammals is similar to that of other classes of vertebrates, without functioning outer hair cells, the sensitivity decreases by approximately 50 dB. Outer hair cells extend the hearing range to about 200 kHz in some marine mammals. They have also improved frequency selectivity (frequency discrimination), which is of particular benefit for humans, because it enabled sophisticated speech and music. Outer hair cells are functional even after cellular stores of ATP are depleted. The effect of this system is to non-linearly amplify quiet sounds more than large ones so that a wide range of sound pressures can be reduced to a much smaller range of hair displacements. This property of amplification is called the cochlear amplifier. The molecular biology of hair cells has seen considerable progress in recent years, with the identification of the motor protein (prestin) that underlies somatic electromotility in the outer hair cells. Prestin's function has been shown to be dependent on chloride channel signaling and that it is compromised by the common marine pesticide tributyltin. Because this class of pollutant bioconcentrates up the food chain, the effect is pronounced in top marine predators such as orcas and toothed whales. Calcium ion influx plays an important role for the hair cells to adapt to the amplification of the signal. This allows humans to ignore constant sounds that are no longer new and allow us to be acute to other changes in our surrounding. The key adaptation mechanism comes from a motor protein myosin-1c that allows slow adaptation, provides tension to sensitize transduction channels, and also participate in signal transduction apparatus. More recent research now shows that the calcium-sensitive binding of calmodulin to myosin-1c could actually modulate the interaction of the adaptation motor with other components of the transduction apparatus as well. Fast Adaptation: During fast adaptation, Ca2+ ions that enter a stereocilium through an open MET channel bind rapidly to a site on or near the channel and induce channel closure. When channels close, tension increases in the tip link, pulling the bundle in the opposite direction. Fast adaptation is more prominent in sound and auditory detecting hair cells, rather in vestibular cells. Slow Adaption: The dominating model suggests that slow adaptation occurs when myosin-1c slides down the stereocilium in response to elevated tension during bundle displacement. The resultant decreased tension in the tip link permits the bundle to move farther in the opposite direction. As tension decreases, channels close, producing the decline in transduction current. Slow adaptation is most prominent in vestibular hair cells that sense spatial movement and less in cochlear hair cells that detect auditory signals. Neurons of the auditory or vestibulocochlear nerve (the eighth cranial nerve) innervate cochlear and vestibular hair cells. The neurotransmitter released by hair cells that stimulates the terminal neurites of peripheral axons of the afferent (towards the brain) neurons is thought to be glutamate. At the presynaptic juncture, there is a distinct presynaptic dense body or ribbon. This dense body is surrounded by synaptic vesicles and is thought to aid in the fast release of neurotransmitter. Nerve fiber innervation is much denser for inner hair cells than for outer hair cells. A single inner hair cell is innervated by numerous nerve fibers, whereas a single nerve fiber innervates many outer hair cells. Inner hair cell nerve fibers are also very heavily myelinated, which is in contrast to the unmyelinated outer hair cell nerve fibers. The region of the basilar membrane supplying the inputs to a particular afferent nerve fibre can be considered to be its receptive field. Efferent projections from the brain to the cochlea also play a role in the perception of sound. Efferent synapses occur on outer hair cells and on afferent axons under inner hair cells. The presynaptic terminal bouton is filled with vesicles containing acetylcholine and a neuropeptide called calcitonin gene-related peptide. The effects of these compounds vary, in some hair cells the acetylcholine hyperpolarized the cell, which reduces the sensitivity of the cochlea locally. Research on the regrowth of cochlear cells may lead to medical treatments that restore hearing. Unlike birds and fish, humans and other mammals are generally incapable of regrowing the cells of the inner ear that convert sound into neural signals when those cells are damaged by age or disease. Researchers are making progress in gene therapy and stem-cell therapy that may allow the damaged cells to be regenerated. Because hair cells of auditory and vestibular systems in birds and fish have been found to regenerate, their ability has been studied at length. In addition, lateral line hair cells, which have a mechanotransduction function, have been shown to regrow in organisms, such as the zebrafish. Researchers have identified a mammalian gene that normally acts as a molecular switch to block the regrowth of cochlear hair cells in adults. The Rb1 gene encodes the retinoblastoma protein, which is a tumor suppressor. Rb stops cells from dividing by encouraging their exit from the cell cycle. Not only do hair cells in a culture dish regenerate when the Rb1 gene is deleted, but mice bred to be missing the gene grow more hair cells than control mice that have the gene. Additionally, the sonic hedgehog protein has been shown to block activity of the retinoblastoma protein, thereby inducing cell cycle re-entry and the regrowth of new cells. The cell cycle inhibitor p27kip1 (CDKN1B) has also been found to encourage regrowth of cochlear hair cells in mice following genetic deletion or knock down with siRNA targeting p27. Research on hair cell regeneration may bring us closer to clinical treatment for human hearing loss caused by hair cell damage or death. The lamina reticularis and subjacent structures. ^ Lumpkin, Ellen A.; Marshall, Kara L.; Nelson, Aislyn M. (2010). "The cell biology of touch". The Journal of Cell Biology. 191 (2): 237–248. doi:10.1083/jcb.201006074. PMC 2958478. ^ Nadol, Joseph B. (1993). "Hearing loss". New England Journal of Medicine. 329 (15): 1092–1102. doi:10.1056/nejm199310073291507. ^ Lush, Mark E.; Piotrowski, Tatjana (2013). "Sensory hair cell regeneration in the zebrafish lateral line". Developmental Dynamics. 243 (10): 1187–1202. doi:10.1002/dvdy.24167. PMC 4177345. PMID 25045019. ^ a b c Cotanche, Douglas A. (1994). "Hair cell regeneration in the bird cochlea following noise damage or ototoxic drug damage". Anatomy and Embryology. 189 (1): 1–18. doi:10.1007/bf00193125. PMID 8192233. ^ Ashmore, Jonathan Felix (1987). "A fast motile response in guinea-pig outer hair cells: the cellular basis of the cochlear amplifier". The Journal of Physiology. 388 (1): 323–347. doi:10.1113/jphysiol.1987.sp016617. ISSN 1469-7793. PMC 1192551. PMID 3656195. ^ Ashmore, Jonathan (2008). "Cochlear Outer Hair Cell Motility". Physiological Reviews. 88 (1): 173–210. doi:10.1152/physrev.00044.2006. ISSN 0031-9333. PMID 18195086. ^ Müller, U (October 2008). "Cadherins and mechanotransduction by hair cells". Current Opinion in Cell Biology. 20 (5): 557–566. doi:10.1016/j.ceb.2008.06.004. PMC 2692626. PMID 18619539. ^ Chan DK, Hudspeth AJ (February 2005). "Ca2+ current-driven nonlinear amplification by the mammalian cochlea in vitro". Nature Neuroscience. 8 (2): 149–155. doi:10.1038/nn1385. PMC 2151387. PMID 15643426. ^ a b Brownell WE, Bader CR, Bertrand D, de Ribaupierre Y (1985-01-11). "Evoked mechanical responses of isolated cochlear outer hair cells". Science. 227 (4683): 194–196. Bibcode:1985Sci...227..194B. doi:10.1126/science.3966153. PMID 3966153. ^ A movie clip showing an isolated outer hair cell moving in response to electrical stimulation can be seen here (physiol.ox.ac.uk). ^ Wartzog D, Ketten DR (1999). "Marine Mammal Sensory Systems". In Reynolds J, Rommel S (eds.). Biology of Marine Mammals (PDF). Smithsonian Institution Press. p. 132. ^ Hudspeth AJ (2008-08-28). "Making an effort to listen: mechanical amplification in the ear". Neuron. 59 (4): 530–45. doi:10.1016/j.neuron.2008.07.012. PMC 2724262. PMID 18760690. ^ Santos-Sacchi Joseph; Song Lei; Zheng Jiefu; Nuttall Alfred L (2006-04-12). "Control of mammalian cochlear amplification by chloride anions". Journal of Neuroscience. 26 (15): 3992–8. doi:10.1523/JNEUROSCI.4548-05.2006. PMID 16611815. ^ a b c d Gillespie, P. G.; Cyr, J. L. (2004). "Myosin-1c, the hair cell's adaptation motor". Annual Review of Physiology. 66: 521–45. doi:10.1146/annurev.physiol.66.032102.112842. PMID 14977412. ^ a b Stauffer, E. A.; Holt, J. R. (2007). "Sensory transduction and adaptation in inner and outer hair cells of the mouse auditory system". Journal of Neurophysiology. 98 (6): 3360–9. doi:10.1152/jn.00914.2007. PMC 2647849. PMID 17942617. ^ Cyr, J. L.; Dumont, R. A.; Gillespie, P. G. (2002). "Myosin-1c interacts with hair-cell receptors through its calmodulin-binding IQ domains". The Journal of Neuroscience. 22 (7): 2487–95. PMID 11923413. ^ Housley, G D; Ashmore, J F (1992). "Ionic currents of outer hair cells isolated from the guinea-pig cochlea". The Journal of Physiology. 448 (1): 73–98. doi:10.1113/jphysiol.1992.sp019030. ISSN 1469-7793. PMC 1176188. PMID 1593487. ^ "Cranial Nerve VIII. Vestibulocochlear Nerve". Meddean. Loyola University Chicago. Retrieved 2008-06-04. ^ Edge AS, Chen ZY (2008). "Hair cell regeneration". Current Opinion in Neurobiology. 18 (4): 377–82. doi:10.1016/j.conb.2008.10.001. PMC 5653255. PMID 18929656. ^ Lombarte A, Yan HY, Popper AN, Chang JS, Platt C (January 1993). "Damage and regeneration of hair cell ciliary bundles in a fish ear following treatment with gentamicin". Hear. Res. 64 (2): 166–74. doi:10.1016/0378-5955(93)90002-i. PMID 8432687. ^ Whitfield, T.T (2002). "Zebrafish as a model for hearing and deafness". Journal of Neurobiology. 53 (2): 157–171. doi:10.1002/neu.10123. ^ Henderson M (2005-01-15). "Gene that may no longer turn a deaf ear to old age". Times Online. ^ Sage, Cyrille; Huang, Mingqian; Vollrath, Melissa A.; Brown, M. Christian; Hinds, Philip W.; Corey, David P.; Vetter, Douglas E.; Zheng-Yi, Chen (2005). "Essential role of retinoblastoma protein in mammalian hair cell development and hearing". Proceedings of the National Academy of Sciences of the United States of America. 103 (19): 7345–7350. Bibcode:2006PNAS..103.7345S. doi:10.1073/pnas.0510631103. PMC 1450112. PMID 16648263. ^ Raphael Y, Martin DM (July 2005). "Deafness: lack of regulation encourages hair cell growth". Gene Ther. 12 (13): 1021–2. doi:10.1038/sj.gt.3302523. PMID 19202631. ^ Lu, Na; Chen, Yan; Wang, Zhengmin; Chen, Guoling; Lin, Qin; Chen, Zheng-Yi; Li, Huawei (2013). "Sonic hedgehog initiates cochlear hair cell regeneration through downregulation of retinoblastoma protein". Biochemical and Biophysical Research Communications. Elsevier. 430 (2): 700–705. doi:10.1016/j.bbrc.2012.11.088. PMC 3579567. PMID 23211596. Fettiplace R, Hackney CM (2006). "The sensory and motor roles of auditory hair cells". Nature Reviews. Neuroscience. 7 (1): 19–29. doi:10.1038/nrn1828. PMID 16371947. Manley GA, Popper AN, Fay RR (2004). Evolution of the Vertebrate Auditory System. New York: Springer-Verlag. ISBN 0-387-21093-8. Rabbitt RD, Boyle R, Highstein SM (1–5 February 2010). "Mechanical amplification by hair cells in the semicircular canals". Proceedings of the National Academy of Sciences. 107 (8): 3864–9. Bibcode:2010PNAS..107.3864R. doi:10.1073/pnas.0906765107. PMC 2840494. PMID 20133682. Lay summary. Breneman KD, Brownell WE, Rabbitt RD (22 April 2009). Brezina V (ed.). "Hair cell bundles: flexoelectric motors of the inner ear". PLoS ONE. 4 (4): e5201. Bibcode:2009PLoSO...4.5201B. doi:10.1371/journal.pone.0005201. PMC 2668172. PMID 19384413. Lay summary. Wikimedia Commons has media related to Hair cells. Outer hair cell dancing "rock around the clock"